Lime milk (lime paste) is calcium hydroxide Ca(OH)2 solution in water. Lime milk production line is equipment which reforms quicklime into lime milk also known as lime paste. This material is widely used in chemical, food, metallurgical, building and other industry branches, environment protection, consumer products and its materials manufacturing. That is why lime paste (which is the same as lime milk) production line is one of the most demanded lime equipment type. Quicklime is loaded into the bin with feeder Bk1 from the storage by feed claw. From the bin with feeder lime is measured on the belt conveyor Kn1 which loads the intermediate bin Bk2. From the intermediate bin it goes into the ball mill of wet grinding MShR1. Out of the mill dead lime flows to the settling reservoir O1 in form of 30% lime milk, where it is separated from undissolving impurity and unconverted feedstock. 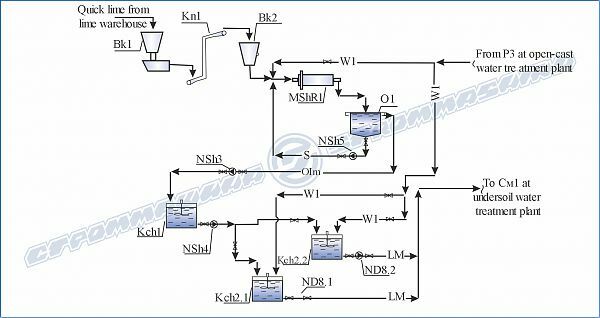 Sludge (undissolving impurity and unconverted feedstock) S goes back into the mill by sludge pump NSh3. Lime milk from the settling reservoir OIm gets into 30% lime milk tank Kch1. Sludge pump NSh4 receives material from settling reservoir to 10% lime milk settling reservoir Kch2, from where it is measured by dosing pump ND8 into the underspoil water. Water W1 is used for concentrate lime milk slaking into working lime. Lime milk line (lime paste line) can be produced according to customer demands.